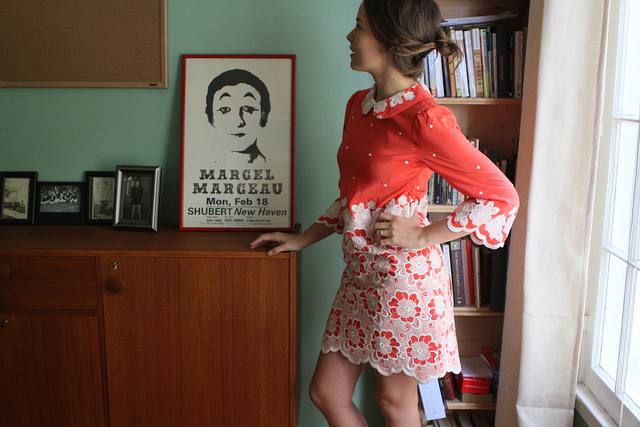 ♥ Pretty much every post on Closet Visit makes me dizzy with dress envy, but Allison Miller‘s embroidered coral ditty stole my heart. How precious is that collar?! ♥ If you’ve ever thought about throwing ‘bows at the thrift store, this print by Tuesday Bassen might make you chuckle. ♥ In this week’s num-num file: Pizza-stuffed chicken breasts, roasted banana bars with maple glaze and all of these citrus-y cocktail recipes conveniently rounded up by Eating for England. ♥ Meet Ashlie Chavez and Jaime Rugh, my latest collage artist crushes. ♥ Mary Beth, aka one of the sweetest Mighty Swell vendors of all time, just kicked off a 31-day home organization challenge on her blog, Occupation Housewife. I can’t wait to follow along! ♥ I’m loving this delicate DIY necklace idea from Liz Kantner and this sweet boho bunting how-to from Wednesday Custom Design. Definitely filing the latter idea away for my bedroom redo. This entry was posted in Uncategorized and tagged clickin' around, links by highplainsthrifter. Bookmark the permalink. Thanks for the mention, lady! Thank you for the sweet mention, Meghan. I got all warm and fuzzy. Hope to see you gals soon when things settle down over here.